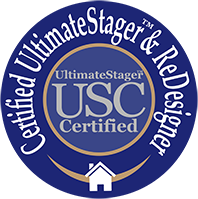 My name is Nina Doiron and I’m the owner and lead designer of iStage & Organize. We are based in Simcoe County and service Simcoe, York Region and the GTA. At iStage & Organize, we work with people who don’t know where to start when it comes to improving their home’s appeal. We offer simple, affordable solutions that make homes look and function better, and also help protect and retain their value. After all, your home is often your biggest investment. Over the years, we have proven that a well-prepared home often sells faster and garners top dollar, simply by standing out from the competition. As a professionally trained and practicing marketer with more than 20 years experience, I understand the art and power of persuasion marketing and its influence on purchase behaviour. At iStage & Organize, I combine these marketing skills with an eye for design to help individuals and families improve their homes, whether for themselves or potential buyers. Our award winning home staging service helps buyers fall in love with properties for sale. But we also see families fall in love with their OWN homes again through our redesign and organizing services. We also assist seniors with the challenging, often emotional process of decluttering and downsizing to smaller spaces. Our clients often tell us how our services have dramatically transformed their spaces and lives, and that they appreciate our friendliness, empathy and attention to detail in guiding them during challenging times. I’ve been happily married to a wonderful man for more than 20 years. We have two wonderful and caring children and an adorable fur baby whom we refer to as our 3rd child. When not working, I love to cook and entertain friends and family, and can put together some mean Italian dishes. I hold a bachelor’s degree in business administration from Northwood University in Midland Michigan and is a Certified Ultimate Stager and member of the Professional Organizers of Canada. Our company has been recognized for our superior customer service by the international design platform, Houzz, for three straight years. I'm also a RESA-Pro and a RESA approved instructor for real estate agents in Ontario. We have been featured on Rogers York Region network, Rock Your Biz Radio and The Home Staging Show. I am honoured to have been recognized as the 2017 Entrepreneur Of The Year by the East Gwillimbury Chamber of Commerce. "Thank you for visiting our website. We so appreciate that you have taken the time to visit us to learn about our services. We would be honoured to discuss our work further and to help you to improve your home’s appeal." To be the most trusted source of helping hand provider for every stages of your home ownership: from helping you to prepare to sell and move residences effectively and efficiently; to helping create a home that you'll love to live in. We will always treat our clients, their home and belongings with care and respect. We will listen and help achieve client's goals no matter how big or small. We are here to help.